Chrysler this year won't use elaborate introductions like the faux blizzard it held for the Aspen in 2006. Another sign of the auto industry meltdown: Journalists covering next weeks Detroit auto show will not be treated to free food, an open bar and entertainment by Chrysler LLC, which will not host its annual Firehouse hospitality suite in downtown Detroit. In past years the automaker has rented the Detroit Fire Department station across from Cobo Center to host media members during the press days of the auto show. But Chrysler is tightening its budget for this years show, nixing the Firehouse, temporary offices at its display on the show floor, free lunches for media during press days and its elaborate car unveilings. Less glitz and no giveaways. These are unfortunate but necessary steps to help return Chrysler to a solid footing, Rick Deneau, Chrysler director of product and brand communications, wrote Monday in a posting on the companys blog, thefirehouse.biz. Costly gimmicks are out, too. Last year, Chrysler flooded the streets in front of Cobo with a herd of cattle for the unveiling of its redesigned Dodge Ram pickup. 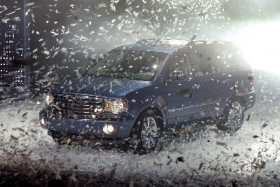 In 2006, the automaker generated a confetti blizzard inside Cobo at the unveiling for the Aspen SUV.